The Volvo S60 is ideally positioned between the larger S80 and smaller S40. 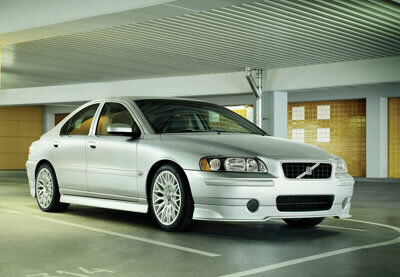 It is Volvo’s sportiest, most dynamic sedan. With high-performance variants such as the T5 and S60 R it is an image leader, demonstrating that Volvo’s are not just “for life” but also for the lively. It opens the idea of Volvo ownership to a younger and active group of buyers who likely otherwise would not have considered a Volvo. For 2006, all S60 models are turbocharged. Four versions of the versatile S60 sport sedan are offered for 2006: the S60 2.5T, S60 2.5T AWD, S60 T5 and the 300-horsepower S60 R.
New All-Wheel Drive with Instant Traction™ is standard on the S60 2.5T AWD. It mates with the S60 2.5T’s 2.5-liter turbocharged engine for positive, instantaneous torque and optimum launch performance. The improved, computer controlled Haldex all-wheel-drive system instantly delivers up to 50 percent more torque to the rear axle only when needed, such as during takeoff.